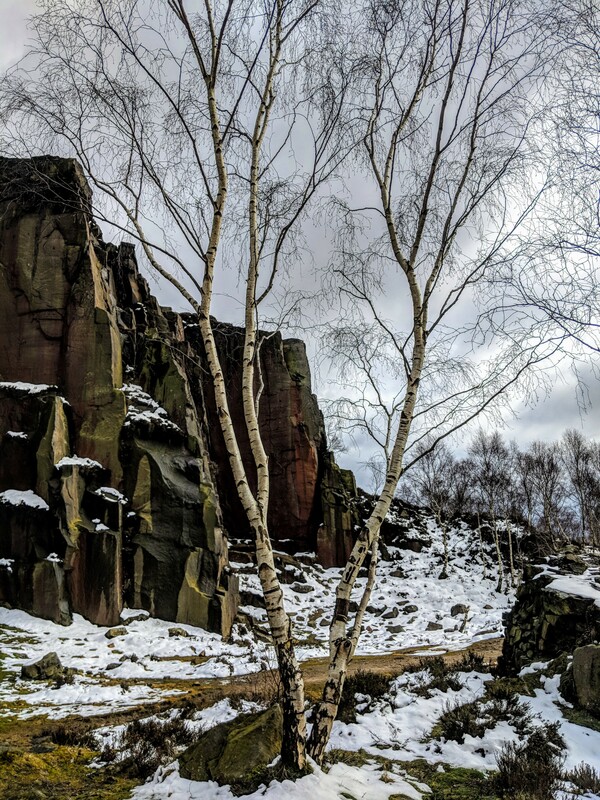 I took a walk down into an old quarry near Hathersage today and was struck by the number of silver birch trees growing here, whilst there was almost a total absence of other types of tree. It got me thinking about how this tree is able to grow so quickly in areas which other trees find barely habitable. Silver birches normally only live to sixty years of age, barely past puberty for most trees. They grow quickly, frantically almost, trying to take hold in the sparse soil, some even manage to grow successfully out of rocky outcrops. They are a classic case of living life in the fast lane and burning out too soon. As “pioneer” trees they have developed their own unique defenses. For instance the silvery, whitish bark provides them with UV protection, important when you’re out in the sun on your own without the protective shade of other trees. The bark is high in essential oils making it taste bitter and nasty to animals who might be tempted to take a nibble on a tender birch sapling. The bark is very easily peeled off and makes a great fire starter, although I prefer to collect this from fallen trees, as taking bark from a living tree can open it to infection and potentially cause long term damage. Right now the sap is rising rapidly in silver birches, I know this for a fact as I tapped a couple last week. Birch sap, otherwise known as birch water, has a slightly sweet taste and is believed to have many health benefits. It’s even possible to buy it in Tesco’s! Another form you may have come across it is xylitol, this is a popular sugar substitute and may cause a more gradual rise in blood sugar levels, avoiding the spikes and troughs we commonly get when we consume sugar, and it may be kinder to teeth as well. Beware though, as too much if it can have an undesirable laxative effect!